The purity, nutrition and healing properties of the mixture of mung beans and rice has been recognized by saints, yogis and people interested in fortifying and detoxifying their body and mind. Mung beans are a great source of protein. 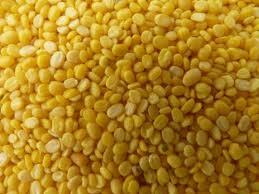 100 grams of mung beans, have about 7 grams of protein. They are also rich in potassium, phosphorus, folate, calcium, and Vitamin A. 1- Wash beans and rice very well. Soak beans in 4 c. water for 2 hours and drain. Bring 3 cups water to boil and add rice, beans, kombu and hing, Cook until tender. Add a pinch of salt. You may add any vegetables about half way through cooking, adding extra water if required. A dried shitake mushroom can be added to boost the immune system. 2- Heat ghee or oil in heavy skillet and add fresh ginger and leek. Then add mustard seeds. When they pop, add the other spices. Transfer a spoonful of soup to the spice mix and blend the two well. Incorporate the spices into the beans and cook for 2 minutes. Garnish with fresh coriander. grated coconut, or freshly grated ginger, depending on your dosha. Enjoy! Living cooking recipe Fennel- roasted eggplant.